We specialize in custom tours to India as well as neighboring Nepal and Bhutan. Ayurveda & Yoga packages , Spiritual tours or simply the Palace on Wheels to explore the exotic state of Rajasthan. Here are a few sample packages. Contact us now at travel@mywebtrips.com for a package specially tailored for your needs. India is known for its Yoga and Meditation as a way of life. India, though taking impressive strides towards urbanization and industrialization, still has locales where the concepts of Yoga and Meditation form an integral part of human life. Rishikesh a well known destination is blended with natural beauty and everything is in tune with nature. A journey worthy of kings. No wonder the experience is labeled the Palace on Wheels. It has been rated one of the ten best luxurious train journeys in the world. South India launches its Luxury on wheels, taking you thru various facets of India. The Golden Chariot offers a unique 5-star experience on wheels with luxury and service to match. 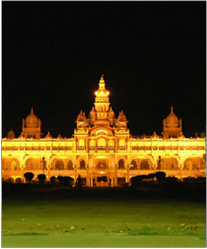 Deccan Odyssey tour takes you on a journey through the historic kingdom of the Marathas. The Deccan Odyssey tour is a journey like no other. Cocooned in royal style, travelers on this luxury train travel on a weeklong journey across Maharashtra and Goa.